The thought of hiring a consultant doesn’t always appeal to manufacturing leaders. It’s easy to think, why should I hire an outsider to come in and tell me how to run my business? But, unless your business consistently hits its goals, maintains perfect quality control, has secure sources of raw materials, regularly finds ways to reduce costs, and maintains a satisfied customer base, an outsider may be exactly what you need. A good consultant doesn’t come in and tell you how to run your business, but rather works with your team to improve your business. That’s not to say there may not be some drawbacks. So, here’s a closer look at what a consultant does, the advantages, and additional considerations. A consultant is an unbiased third-party who will come into your facility to gain an understanding of how your operations work and offer strategies to further improve upon what you’ve established. Rather than assigning a biased employee with the task of streamlining your current operations, consultants offer specialized assistance to optimize your organization. Often, manufacturers “can’t see the forest for the trees,” meaning that they can get so caught up on small details of their business that they often fail to see the bigger picture. While all manufacturers are unique, good consultants will have worked through many of the same problems their client is facing, and can offer a perspective based upon what they’ve seen work—or not work—in the past. Armed with this experience, they are also often able to bring new and innovative ideas to the table that their clients may never have considered on their own. 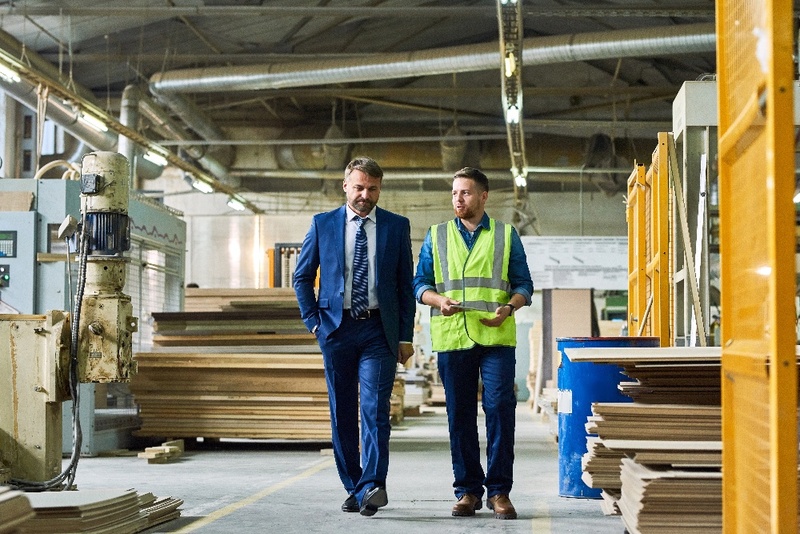 As a manufacturer, hiring a consultant could be the move that’s needed to transform your organization into one that is even more efficient, prosperous, and lean. The primary objective for any business, regardless of industry, is growth. However, achieving sustainable growth in manufacturing can be difficult due to the nature of the industry; growth often requires innovation, which can be slow, expensive, and risky. However, failure to innovate can be just as risky; 88% of Fortune 500 firms that existed in 1955 no longer exist today. This is when hiring a consultant really pays off. When a manufacturer is aware of its limitations and has clear goals, but doesn’t necessarily know how to implement a proper strategy to promote growth, a consultant can provide sound solutions using a variety of tactics that have worked for past clients. The consultant will help to formulate a plan for innovation while reducing production costs and limiting risks. To get the next generation interested in manufacturing, some consultants make a strong effort to recruit the youngest Millennials and oldest members of Generation Z (the oldest were born in 1995) by showcasing their clients’ industry. For instance, Manufacturing Day is a national event where manufacturers can host an open house at their facility and invite local area schools. This gives students an inside view of manufacturing and potential career options for the future. Consultants may also suggest other techniques for recruitment, including apprenticeships; since January 2017, employers have hired nearly 410,000 apprentices! Consultants will also help to develop the existing workforce by exposing them to new technologies that may be just around the corner and developing plans to capture the tribal knowledge of the facility that can be passed down to new, current, and incoming employees. Lean manufacturing is a continuous improvement strategy that takes a customer-first approach, an understanding that people are the most valuable resource, and a shop-floor focus. While Lean offers tremendous benefits, many initiatives fail due to people’s resistance to change. It can also be difficult for small manufacturers without Lean knowledge to implement. And, medium-sized manufacturers offering multiple products with multiple production processes can find the concept overwhelming and possibly even harder to implement. This is another area where a consultant can be a life-saver. A good consultant will aim to eliminate waste in several areas while streamlining company processes from the front office to distribution. In short, you and your consultant should work together so you both have a clear understanding of the steps that need to be taken to deliver results with the least amount of wasted effort. The consultant will also work to communicate the new direction to all employees to ensure the initiative is accepted—and successful. Consultants will inevitably take a look at the supply chain and ways that it can be developed and improved upon to create and distribute better products at a lower price point. Consultants will take a 360-degree view of the supply chain, including evaluating suppliers, managing risk, identifying potential bottlenecks, and analyzing metrics. While this would take considerable effort if the job was tasked to a current employee, having an outside consultant with supply chain experience makes the process much smoother. Your consultant will likely have experience in your field and will have worked on past projects that mirror your situation. This can give you peace of mind knowing that your business is being guided by an expert who is no stranger to situations like yours. When you’re in the trenches day after day, it can be hard to get a big picture view of the business. Rather than trying to improve operations from the inside out, bringing in an outsider who can offer their unique viewpoint on your current state of business may help improve efficiency and foster growth. Hiring an employee versus a consultant can get costly: there’s training, the cost of benefits, finding work space, providing equipment, and more. Plus, consultants are often hired to tackle a particular project within a specific timeframe—they know their time with your company is limited. So, bringing aboard a consultant often costs far less than hiring a brand new full-time employee (of course, the rates depend on the type of consultant you hire, their experience, and the scale of the project). The relationship between a manufacturing organization and consultant should be professional, collaborative, and friendly. Still, a consultant’s job is to find areas for improvement and offer advice, which can often feel like criticism. Remind yourself not to take it personally, and always remember the common goal—to improve your company’s operations. If you find you cannot work collaboratively with a consultant and there are personality clashes, it might be best to search for a new consultant; you’ll want to have a separation clause in your contract for just such a scenario. While consultants should be experts in creating customized solutions for each manufacturer, some may still approach the job with a one-size-fits-all mentality. Rather than offering their solution and leaving before it’s properly implemented, consultants should be held accountable should their strategies not live up to your expectations. Bringing in a consultant has the potential to affect the morale of permanent employees; they may see it as a slight against them that an outsider had to be brought in to fix something they couldn’t, or they may fear for their job, concerned the consultant will recommend downsizing. In addition, if a consultant’s contract is short, he or she may not see the need to establish good rapport with permanent employees, further lowering morale. So, it’s important to communicate clearly with employees why the consultant is being hired and to ensure them that it’s nothing against them—and that their job is secure. Asking for outside help isn’t always easy, but the rewards can be well worth it! While consultants are often hired to focus on one project, their success in that assignment can lead them to be kept on board longer to help in other areas. This would be an ideal situation as both parties would benefit equally. As with all hires, your organization should weigh the advantages and disadvantages of each potential consultant and take into account their specialty and experience. For more on how to make the right choice in hiring your manufacturing consultant, contact one of our experts today!